With spring renovations well underway, most courses will be looking to aerate the greens and get some new topdressing materials back into the surface to restore levels and maintain surface porosity. Choice of aeration varies between solid tine and hollow tine spiking depending on your goals, with the aim of getting some air back into the soil profile. Vert-draining using solid tines to a good depth (preferably >8 inches) should help the roots to start chasing the moisture down the soil profile, providing the sward with a stronger root system, which is the foundation of plant growth success. This will be followed by topdressing with a compatible rootzone material. Do not over-do the topdressing rates; you do not want to smother your sward. The type of sand used in topdressings is vitally important, and you should be aware that most sand sales in the UK are for other uses. The sports turf market is small in comparison, so be careful if you are offered cheap materials, as these can be finer, differ in shape, colour, lime content and be more interpacking than the sands specified for sports turf. For golf courses, the dominant particle range in the sand should be medium sand (0.250mm to 0.5mm). The amount of topdressing will vary dependant on your needs. However, in the spring you would be looking to spread between half to one and half tonnes of material per green (2 to 3mm of material per m2). Many Greenkeepers are now topdressing on a monthly basis, a little and often approach. Feeding programmes should be determined by soil analysis. Obtaining nutrient levels for greens, tees and fairways will provide essential information that can be used to help choose the appropriate fertiliser product for your given turf surface. There are a wide range of fertiliser products now available and tailored to stimulate healthy grass growth. 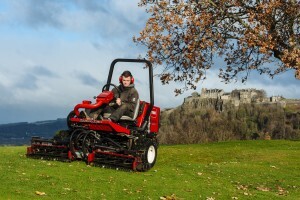 It is important that your mowing machines are serviced regularly and are set up accurately, ensuring that both the height of cut and blade sharpness are correct. Damaged blades affect sward quality. Irrigation systems should have been tested and calibrated by now, there is a need to ensure that all sprinkler heads are working and delivering the appropriate amount of water to the turf. You should calibrate your sprinklers at least once a year to ensure the spray pattern and coverage is sufficient for your needs. This can be done by placing out a number of catch cans on your green and measuring the amount of water collected. You may be surprised to find how much your sprinklers are actually delivering. There may be a need to irrigate during spring renovation programmes, as air temperatures and daylight hours are getting longer, increasing the likelihood of the ground and surfaces drying out. Once these spring renovations are completed, you can then get on with the daily routines of maintenance. Now, mowing operations are in full swing, with frequencies varying from daily to weekly operations dependant on the growth of the grass and the standards set by the course managers. Mowing heights may vary depending on local conditions, type of course, course expectations, sward type and mower type. The mowing heights are a guide, and will be subject to local weather conditions, but remember not to remove more than 1/3 of total grass height in each cut. The less stress that is placed on the grass at this vital time the better the results further on into the season. * Greens - height should be maintained at around 4-6mm. * Tees - height should be maintained at around 10-15mm. * Fairways - height should be maintained at around 15-20mm. * Rough, semi rough grass areas - mow and tidy up these areas. Ensure you clean your mowers after use (wash down or blow off ), ensure you apply some WD 40 or similar oil based lubricant on the cutting cylinder after washing down. Keeping them clean makes the job of checking cutting heights and maintaining the bottom blades easier. Hole changing should be carried out regularly, at least three time s per week as a general rule; however, frequency will be dependant on a number of factors - green size, greens construction, tournaments, amount of play and condition of the green. During any wet periods, it is likely the hole will wear more quickly, resulting in a crowning affect and surface wear. This wear is more apparent if the green has thatch problems. The hole will tend to wear quickly and form a depression, caused by the placement of the golfers' feet. At this time of the year, it is important that all machinery is in good condition and well maintained. Machinery downtime, due to lack of maintenance or poor set-up, can be costly. As the weather continues to improve, you will be all-out to keep your course in tip top condition. Courses with their own workshop and mechanics will be at an advantage. Those without such luxuries need to be ahead of the game - all machinery should have been serviced and back in action by now. Having a good wash down facility is an essentail tool for keeping equipment clean; it is a wise investment. Ponds, lakes and streams - Inspect all water features on course, cleaning out any unwanted debris and litter. Some clubs arrange for their ponds to be dredged to clean them out while at the same time recovering any stray golf balls. Tee boxes, tee markers and competition markers should be inspected daily, cleaned and moved to new tee positions as required. Regularly empty litter bins/tee boxes. Mark out trolley areas, out of bound site areas, ground under repair (GUR) and range markings. Estimate and order seed, loams and fertilisers, fuels and other consumables.